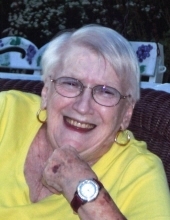 Janet Lorena (Demastus) Thomas, 91, widow of Paul H. Thomas of 1575 Roman Road, Mt. Sidney, passed away Sunday, April 14, 2019 at her residence. Mrs. Thomas was born on December 14, 1927 in Augusta County, the daughter of the late James Lewis and Rena Catherine (Bishop) Demastus. Janet was a member of Augusta Stone Presbyterian Church and the Soroptimist Club (Business Women of Staunton.) She graduated from Mt. Sidney High School in 1946, she was a volunteer for the March of Dimes and Fresh Air Children Organizations. In 1970 Janet and her husband Paul purchased the Beverley Restaurant and ran the business for 45 years until her retirement in 2015. She enjoyed talking, visiting, feeding her customers, participating in various clubs and doing volunteer work. Janet loved being with her grandchildren, playing cards, dancing and spending time with her pet dogs. She will be remembered for her homemade spaghetti sauce, meatballs, and being a lover of chocolate. Surviving is her daughter, Alisa (Thomas) Norcross and her husband Ray of Mt. Sidney; and four grandchildren, Lindsey N. Norcross of Durham, North Carolina, Whitney N. Crummett and her husband Justin, Dillon M. Norcross, and Sydney K. Norcross, all of Mt. Sidney. The family will receive friends from 6:00 p.m. to 8:00 p.m. Wednesday, April 17, 2019 at the Coffman Funeral Home and Crematory. A private graveside service will be conducted in Augusta Memorial Park. It is suggested those desiring make memorial contributions to Staunton Augusta Regional SPCA, P.O. Box 2014, Staunton, Virginia 24402, Shenandoah Valley Animal Services, 1001 Mt. Torrey Road, Lyndhurst, Virginia 22952, Valley Mission, 1513 West Beverley Street, Staunton, Virginia 24401, or charity of your choice. To send flowers or a remembrance gift to the family of Janet Lorena (Demastus) Thomas, please visit our Tribute Store. The family will have a private burial in Augusta Memorial Park. "Email Address" would like to share the life celebration of Janet Lorena (Demastus) Thomas. Click on the "link" to go to share a favorite memory or leave a condolence message for the family.